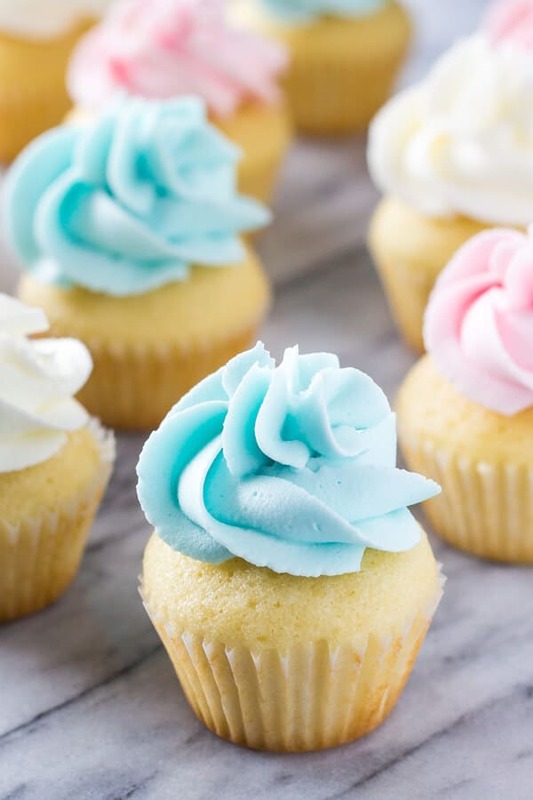 Learn all the tricks to making perfect Mini Vanilla Cupcakes – These are perfectly moist, topped with creamy buttercream & so pretty! In November, my sister is getting married. 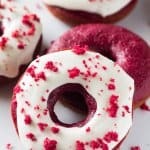 And while I’m not providing the wedding cake (I’d prefer a stress free mimosa prior to the ceremony thank you very much) – I will be commemorating the occasion with a delicious treat. 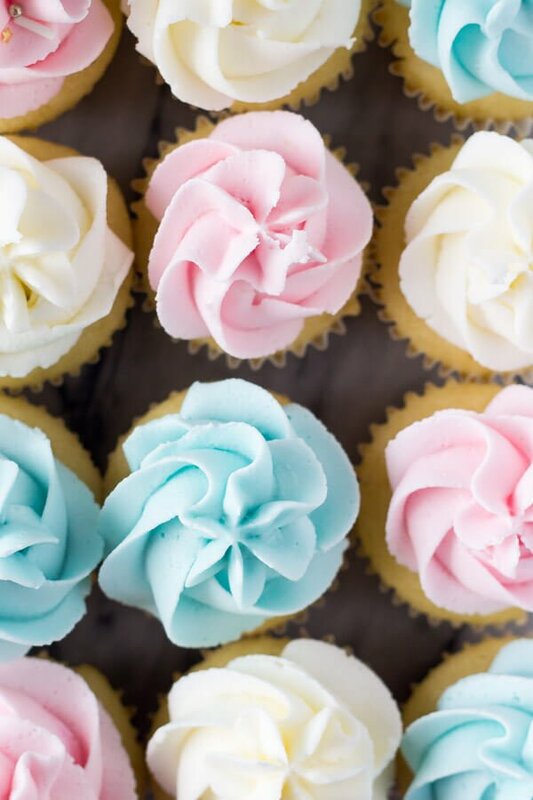 And I don’t think there’s a better way to celebrate than with mini vanilla cupcakes. Delicious, soft & fluffy cupcake happiness; topped with a swirl of creamy buttercream; and devoured in 5 seconds of pure bliss. Plus, mini desserts are way prettier, way cuter, & way harder to resist. It’s like a beautiful rose bed of mini vanilla cupcake deliciousness. Now, I definitely don’t think you should wait for a momentous occasion to learn how to make mini cupcakes. So today I’m sharing with you all my tips. Whether you’re making mini cupcakes for a bridal shower, mini cupcakes for birthday parties, or mini cupcakes because it’s Monday. 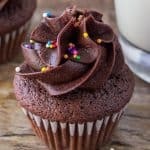 Here’s my favorite mini cupcakes recipe, with all the tips. 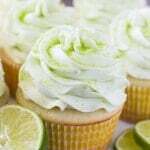 Now, this recipe makes vanilla cupcakes that are perfectly moist AND fluffy in texture. They’re super moist because we’re using buttermilk and sour cream. Then they’re light & fluffy because we’re using a combination of all-purpose flour and cornstarch. By using this combination, we’re essentially making cake flour ourselves, so our cupcakes have a delicate crumb. You’ll notice that the batter for this recipe is a little thicker than my other vanilla cupcake recipe. This is because we want our mini cupcakes to be sturdy so that they don’t topple over from the weight of the frosting. To bake mini cupcakes, you’re going to need one (or multiple) mini cupcake/mini muffin pans. Then it’s super important that you line each cavity with mini muffin paper, not candy cup papers. Candy cup papers are too small, and if you use them your cupcakes will overflow and won’t bake properly. Then you’ll want to fill each of the liners about 2/3rds to 3/4 cup full. I like to use a small cookie scoop for this – a 2 teaspoon cookie scoop or a 1 tablespoon cookie scoop work well. Then the cupcakes are popped in the oven and baked for about 11-13 minutes, or until an inserted toothpick comes out clean. Make sure that your oven rack is centered to prevent burning. To be honest, the most time consuming part of making these cupcakes is piping the frosting on all these delicious morsels. Now typically when I make vanilla buttercream I like to use 100% butter as the base. However, since mini cupcakes often sit on a dessert table for an entire evening – we’re adding a little shortening to this recipe. Shortening is solid at room temperature (unlike butter), so it helps keep your cupcake frosting firm. Also, if you use clear vanilla extract and a little shortening in your buttercream, it will be a crisper white color. If you aren’t concerned with your buttercream losing it’s shape, feel free to replace the shortening with butter. It’s totally up to you. However – I definitely recommend using whipping cream instead of milk for the creamiest, richest flavor. I’ve already made multiple batches of these cupcakes as pre-celebration, celebrations. And I love how fluffy and completely delicious they’ve turned out. Now I’ll need to experiment with mini chocolate cupcakes! 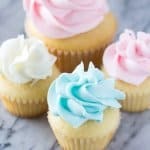 Learn all the tricks for making fluffy, super moist mini vanilla cupcakes topped with vanilla buttercream! 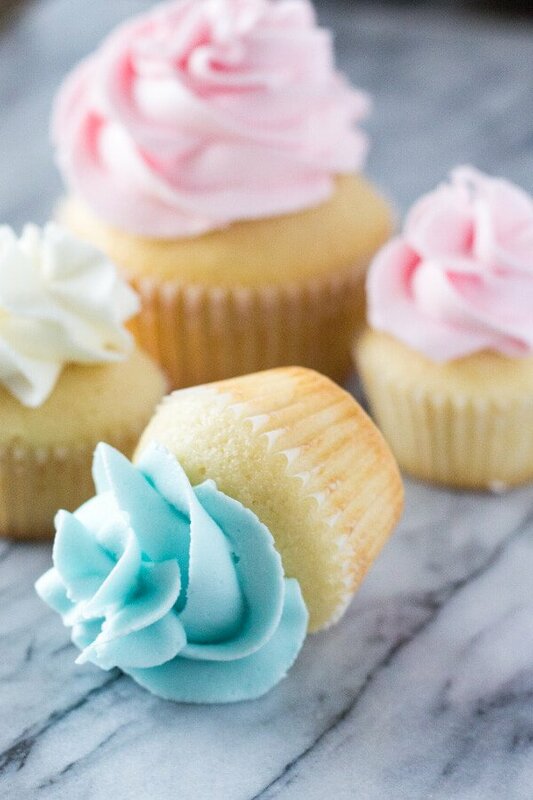 These mini cupcakes have a delicious vanilla flavor and are perfect for wedding showers, birthdays & baby showers. Preheat the oven to 350F degrees and position your oven rack in the center. Line mini muffin pans with mini muffin papers (no candy cup wrappers). You'll end up with about 35-40 cupcakes total. In a large bowl whisk together the flour, cornstarch, baking soda, baking powder and salt. In a separate large bowl using an electric mixer on medium speed, beat together the butter and sugar until fluffy. Add in the eggs and vanilla and continue beating . Turn off the mixer, and scrape down the sides of the bowl using a large rubber spatula or wooden spoon. Then stir in the sour cream. With the mixer on low speed, beat in the flour followed by the milk. Careful not to overmix. Fill each cupcake liner about 2/3rds to 3/4 full. I like to use a small cookie scoop to make this process easier. Bake in the preheated oven for 11-13 minutes, or until an inserted toothpick comes out clean. Start watching your cupcakes at 10 minutes, since these can easily burn. In a large bowl using an electric mixer beat together the butter and shortening (about 2 minutes). It may still see some clumps, which is ok. Beat in the vanilla and salt. With the mixer on low speed, beat in 3.5 cups of powdered sugar. Beat in the rest of the powdered sugar and whipping cream slowly until you reach the desired sweetness level. Beat in the food coloring (if using), then turn the mixer up to medium-high speed for about 20 seconds. To frost the cupcakes, use a flat edge knife. Or spoon the batter into a piping bag and swirl the frosting on top. I used a 1M Wilton frosting tip and 14 inch piping bag. Made these for a baby shower and they turned out perfectly! Where did you get the liners from? Just finished baking these… incredible!! Such a simple recipe to make even for a last minute get together. Will definitely be making these again. 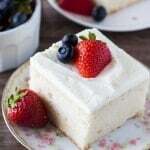 I usually have a difficult time with the frosting, but this buttercream recipe was so easy. I think the trick was the shortening. I used Nutiva palm oil shortening and it held it together beautifully. Thanks Fiona, for a simple yet scrumptious dessert! I made these cupcakes for a pull apart Birthday cake – turned out cute! I felt that they were dry but didn’t seem overbaked? Followed instructions perfectly. Any thoughts what I did wrong? Thank you! 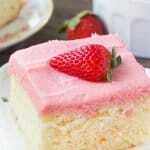 Really want to try again – frosting is delicious! Ps I used butter/vanilla emulsion in place of just vanilla – was that it? My local baker recommended it? I just made these for my son to take to Preschool for his birthday. They turned out SO delicious! I cut the amount of salt in the frosting by half, and it was still plenty. Great recipe!